Scarred on the inside and out, RCMP officer, Tempest Forge, seeks out the man who murdered her husband, child, and a number of young girls. She's been hot on his trail for years, but can't stop the man alone. Her ability to read minds helps her, but she blocks more than the thoughts of the psychotic killer. The last thing she expects is to find love with a modern day Ojibwa, who has his own strong psychic abilities. He is known as Wind, and able to speak to the animals. Tadi McCoy is the last of his brothers to find true love, but he can't seem to get the woman of his dreams to accept it, let alone return it. 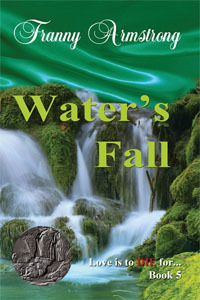 When she sets out alone to tackle her quarry, Tadi must find her, or lose her forever. “Why am I here, Misu? Why here?” she asked. His attempt at humor wasn’t beyond her, and she chuckled. A bitter chuckle, but a chuckle nonetheless. Sitting up, she turned to him and he bit back a groan. She was beautiful. The moonlight glanced off her hair and reflected in her wide eyes. He swallowed hard. “Well, you’re in my territory now and I know it from stem to stern. So, why don’t I just teach you my world? That way, you can know them both, and your world will get larger. I can teach you how to survive in the wilderness with nothing more than a knife and some matches.” Misu knew he’d found her Achilles heel. She was riveted, excited, ready to go! Loving the eager expression on her face, he answered. “The wedding’s tomorrow. Why don’t we leave at first light the next morning? Okay?” he said, his voice husky. He wanted to kiss her, hold her close, yet he knew that it was too soon. She needed to trust him before she’d be comfortable with that. Misu was happy to see she had found her humor again. He knew then, that she was going to be all right. He reached up and waved her over. “Come on, Little Mouse. Let’s go see if Taran and Kylene are at the house yet.” He waited, letting her choose to come to him. After a brief pause, she avoided his help and jumped off the rock, landing with an, “Ompff.” Standing, she muttered, “Damn shoes are no good for anything.” Limping slightly, she started walking back to the cabin. “Ah, Maylin?” he said, hiding his grin. “Well what are you waiting for, Tree Trunk? Let’s get back.” Impatient now that she had a goal, she glared up at him. Blowing out a deep breath, she growled, “Well why didn’t you just say so?” Off she went through the woods, muttering under her breath.